One 32" × 42" map, 49 counters, and a ziplock bag to hold them. Urban Renewal . . . Car Wars Style! Welcome back to beautiful downtown Midville! 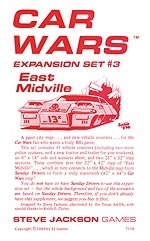 Car Wars fans who enjoyed their visit to the "toughest little town in America," as presented in Crash City, now have twice as much town to play in. This set contains 31 vehicle counters (including two more police cruisers, and a new tractor and trailer for you truckers), an 8" × 14" rule-and-scenario sheet, and two 21" × 32" map sections. These combine into the 32" × 42" map of "East Midville" . . . which in turn connects to the Midville map from Crash City to form a truly mammoth (42" × 64") Car Wars map! 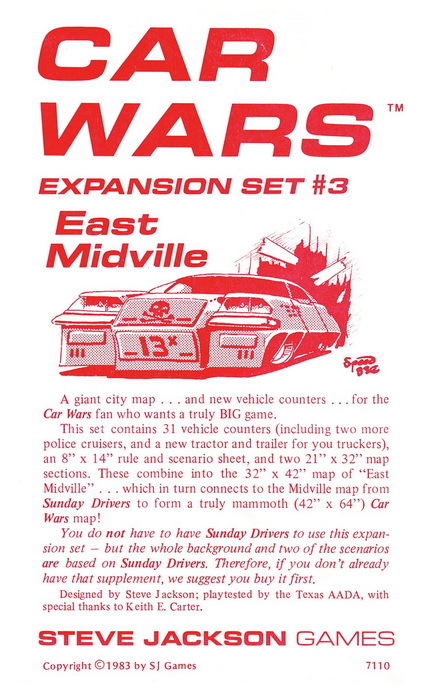 With more maps, new counters, and four new scenarios, this set is perfect for the Car Wars fan who wants a truly BIG game.